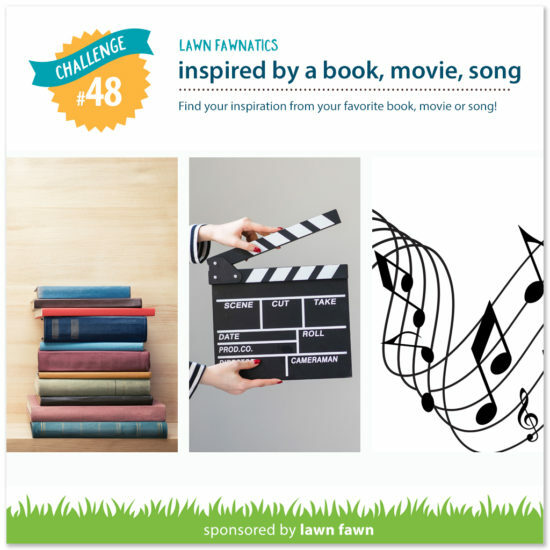 Lawn Fawnatics Challenge 48 – Inspired by a Book, Movie or Song! I was so excited to see this months challenge and I have been so inspired by everyones cards. I had a couple ideas in mind but I really had to make one as a favorite childhood cartoon; David the Gnome. I got my love of gnomes from that show. My card features David and his best friend Swift the Fox. The card features the new Lawn Fawn speckled papers in blue and green. I also used some of the woodgrain cardstock in the dark brown for David's house. RV66, R29, R27, R24 for the reds. B97, B95, B93 for the blues. I've never seen that show, but it makes me wish I had! I love gnomes and I love your card. So dang cute! Thanks so much for playing with us at Lawn Fawnatics! I don't know this show but I love your card! Oh my goodness, this was my favorite show as a kid!!! I'm totally in love with your card, so perfect. Love that tree with the door in it. Thansk for sharing it with us at Lawn Fawnatics!! !